1) Try more light or if they don’t bloom in winter due to lighting changes then place under a lamp. 2) Consistent watering, if the plant gets very dry frequently it will probably stop flowering. 3) Side-growths or “sucker” plants. New crowns forming on the sides and baby plants emerging will drain the energy used for blooming. Remove them for best blooms. 4) Soil PH too high or low. If your violet has been in the same soil for over a year then the PH may have changed, Re-pot every 8 months to 1 year (with African Violet soil) for robust health. 5) Too Low humidity. If it is below 40% then the buds will form but will dry up before opening. ♥ Experiment a little. Try a different window or light source, be certain the AV only gets indirect sunlight, never full sun. ♥ Artificial light is fine, a small fluorescent lamp is enough light for most varieties, LED lights also work quite well. ♥ If new blooms don't appear within 3 weeks, try a different location or window and check that watering is consistent. ♥ Maintain moist soil but don't let stand in water. Allow to dry just a little between waterings. Never let the soil get bone dry, shoot for even, consistent moisture. ♥ To simplify watering, use a wick based self-watering system. ♥ If still no blooms, or blooms begin but dry up - Check humidity levels. AVs need around 50% relative humidity to blossom. Avoid drafty areas. ♥ Air Too dry? Place pebbles in a shallow tray of water and put beside your AV, or place pot on top, sitting on the rocks (not touching the water). The evaporation will provide enough moisture for the plant's needs. ♥ Soil PH can be the problem. Natural processes in soil and salts from fertilizer and water can change PH over time. 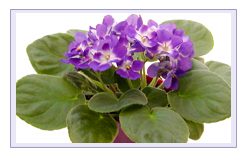 Re-pot violets with fresh AV soil every 6 moths to 1 year to encourage more blooms. Keep in 4" to 6" pot, they like to remain root-bound. 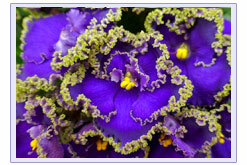 Not all African Violets will respond the same to light and temperature conditions. Once you find what works for yours, keep it consistent and you'll be rewarded by cycle after cycle of colorful & happy flowers!